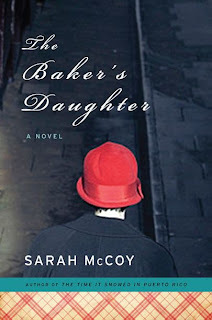 The Baker's Daughter by Sarah McCoy is one of those books that grabs you and refuses to let you go. There are so many elements that rise to the surface with this one that I found myself having to put the novel down and walk away for a bit to digest it all. I went through a wide range of emotions while reading this one. The Baker's Daughter is a story that spans three generations and focuses not only on the past, but is laced with implications for the present. The format of the book was refreshing since it took so many forms. There is narrative, letters, emails, and recipes that help tell the story. One main story line surrounds the life Elise Schmidt, a German teen who helps run her family's bakery, as the Third Reich's power holds the land in its iron grasp. I thought I knew so much about the German experience during WWII, but this book forced me to look at things with a different perspective. I had never once stopped to consider what life was like for the German people. So many times I fell into the trap of believing that they all must have accepted Hitler and his agenda - and while this would hold true for some - there were just as many people in Germany who disagreed with Hitler. Voicing opinions in this time period could result in death so many had to hide their opposition. Elsie's story gives voice to those who had to hold their tongues during this time period. I also really enjoyed it because most often women during this time period were not given equal rights and their experiences were seen to have little value. That becomes abundantly clear based on Elsie's older sister, Hazel's, experiences in the Lebensborn Program. I had never heard of this program before which led me to the internet to do some searching of my own. I have no idea how I missed the existence of this project. I have a degree in History, but my only in depth study of WWII was from the military and political standpoints. Again, I was exposed to the male view of these events and the female voices were left largely silent. Basically, The Lebensborn Program was a way to increase the ranks of the Aryan race. Young German women lived in homes and were basically used for breeding purposes. Once children were born, mothers were no longer integral in their lives beyond feeding. The children were raised and instructed by the SS. Babies who did not appear strong enough were often killed. The inclusion of this in the book was one of the things I found to be fascinating. Watching Hazel as she deals with the effects of this system was truly heart breaking and helped me see history from a different vantage point. There are so many other elements in the 1940's segments of the book that are also well written and intriguing, but this was the one that stuck out the most for me. The second story line is set in 2007-2008 in El Paso, Texas. Elsie is now an elderly woman running a bakery in the border town and she is being interviewed for a local piece on Christmas traditions by Reba Adams. Reba has her own set of issues - including an engagement ring that she chooses to wear around her neck rather than on her finger. Finding Elise and her daughter, Jane, marks the beginning of a transition for Reba that will help her find out who she really is and what makes her happy. Reba's fiancee, Riki, is also an important fixture within the contemporary segments of the book. He is a Mexican American who watched his parents struggle in Mexico while awaiting their US citizenship. To prove that he is an American, he joins the US Border Patrol and hopes to help others see that there is a right way and a wrong way to get to America. However, after many nights on the job and some heart wrenching moments he starts to realize that not everything is so black and white. I found it so compelling that McCoy chose to tell these two types of stories along side of one another. I would never have thought that German experiences during WWII would work so well alongside the current debate about immigration to the United States from Mexico. It also really made me stop and think about what life is like for those who are desperately seeking admittance into the land of the free. I appreciate that McCoy is shining a light on something in society that truly needs a solution. I can see the reasoning behind both those that support stricter immigration laws and those who want to cross the border. I don't pretend to have answers to how we can solve this conflict, but I do think generating discussion and thought around the topic is crucial. Discrimination and prejudice are nasty beasts that have plagued humanity since the dawn of time. We can never truly quell their vicious nature until we learn to see those who are different from us as valuable. In addition, I was also drawn to these characters and their struggles. In particular, I found myself relating to Reba. She is unhappy with her life, but can't quite put her finger on what's missing. She thinks if she can just move to California and just snag her dream job then everything will be fine. Reba even remarks that she'd, "always been melancholic and unsatisfied with nearly everything about herself" (pg. 32). I often have that mentality and I'm trying to break myself out of that way of thinking. I have so many wonderful things in my life, but sometimes I just crave those things that are slightly beyond my grasp. I think that is human nature, but the problem is some of us dwell on what's lacking rather than focus on what is right in front of us. Like Reba, I need to calm down, take a deep breath, and just enjoy living. There is so much heartache and hardship in the world; I need to be thankful that my life is comfortable and I am loved. I am learning to be comfortable in my own skin and I always find it some comforting to find characters who are going through the same struggles. Reba held up a mirror for me to explain my own flaws and think of ways to grow beyond what I see reflected. 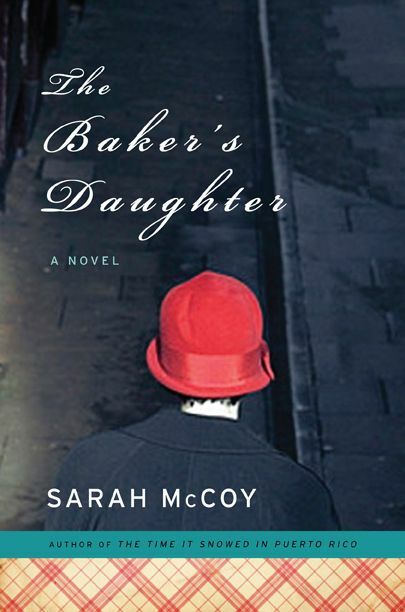 The Baker's Daughter is a book with so many delicious layers written in compelling prose. It is a critique of love, the human spirit, and racism. It is also a look into the hearts and minds of strong women who have made impossible choices in the midst of bleak times. Ultimately, The Baker's Daughter is a triumph of the human heart and the impressions we make on the lives of others. I highly recommend this book to those who enjoy historical fiction, women's history, and those looking for critiques on families and love. I don't think its possible for me to capture in this review how much I loved this book and how deeply it spoke to my heart. In closing, I'd like to leave you with a quote that really spoke to me: "The marks on our lives are like music notes on the page - they sing a song" (pg. 123). I am inspired to go forth and make sure the marks I leave in my encounters with others will produce beautiful harmonies. One Last Gripe: I wanted to know more about Josef and the ship. What truly happened? First Sentence: Long after the downstairs oven had cooled to the touch and the upstairs had grown warm with bodies cocooned in cotton sheets, she slipped her feet from beneath the thin coverlet and quietly made her way through the darkness, neglecting her slippers for fear that their clip might wake her sleeping husband. 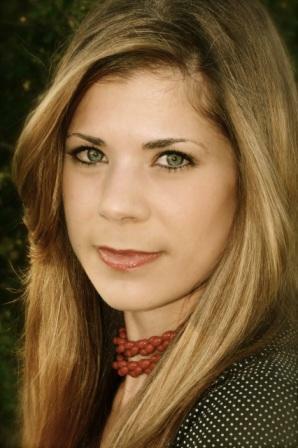 SARAH McCOY is author of the novel, The Time It Snowed in Puerto Rico. She has taught English writing at Old Dominion University and at the University of Texas at El Paso. The daughter of an Army officer, her family was stationed in Germany during her childhood. She calls Virginia home but presently lives with her husband and dog, Gilbert, in El Paso, Texas.The Baker’s Daughter is her second novel. She is currently working on her next novel. Tuesday, February 7th: You’ve GOTTA Read This! It is worth a read. Beautiful writing and a captivating story. I loved every moment. Wonderful review! I loved this book, too, and I also wanted more about Josef and the ship. I've linked to your review on War Through the Generations. Thanks for linking the review! I'm also glad to see you loved the book as well. Josef was such a complex, heart breaking character. I wouldn't have thought that a WWII story and a modern day immigration story would mesh either, but apparently I was wrong! Glad to see this was such a great read. Thanks for being on the tour! Wow, I'd never heard of the Lebensborn Program either. I think it would be interesting to see WWII from the German POV. This one sounds good! The layers the author weaves has piqued my curiosity!